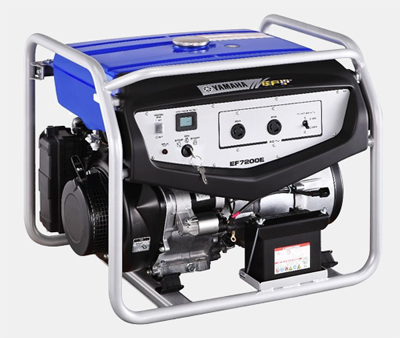 The EF7200E provides serious full time power and offers 10 hours of operation without refuelling, has an electric starter for hassle-free start-ups and is capable of running most homes in an emergency situation (including taking on heavy load items such fridges and air conditioners). It features: low wave deformities for sensitive equipment such as micro-computer controlled electrical appliances, an economy mode, big tank for long power outages and the first digital multi-function meter display which displays cumulative running time (hours) and voltage. Displays cumulative running time (hours) and voltage. Engine stops automatically when oil level(pressure) has fallen bellow the prescribed level. Easier 'on' & 'off' of AC output with circuit breaker. Easy to carry & solid protection.